The 2019 Cricket World Cup is scheduled to be hosted by England & Wales from 30 May to 14 July 2019. This will the 12th edition of the World Cup and it will be the fifth time that the Cricket World Cup will be held in England and Wales. They had earlier hosted 1975, 1979, 1983 and 1999 World Cups. The 2019 World Cup will feature 10 teams whereas the 2011 and 2015 World Cups featured 14 Teams. The 1975 Cricket World Cup was the first edition of the World Cup, organized by the then International Cricket Conference (ICC). It was sponsored by Prudential Assurance Company and was officially known as Prudential Cup 1975. The tournament had eight participating countries: six Test-playing teams (Australia, England, New Zealand, India, Pakistan and West Indies ), then associate nation Sri Lanka and, for the only time, East Africa. The tournament was played from 7 to 21 June 1975. Each match consisted of 60 overs per team and the teams played in traditional white clothing and red balls. England, New Zealand, West Indies and Australia qualified for the semi-finals. It is the only World Cup till date wherein no team from the subcontinent featured in the semi-finals. The West Indies beat Australia in the final at Lord's by 17 runs to win the World Cup. All the Cricket playing nations have been regularly issuing stamps on cricket. Cricket is popular in Commonwealth countries and these nations have issued stamps on one day international World Cups since the inaugural tournament in 1975. A miniature sheet was issued by Trinidad and Tobago on 4th October 1976 to commemorate the victory by West Indies. The sheet consisted of two stamps. 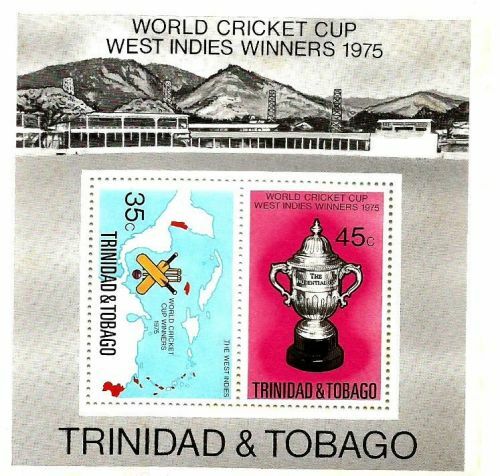 The 35 cents stamp features the Map of Caribbean, two cricket bats, stumps, bails and a cricket ball. The 45 cents stamp features The Prudential Cup. 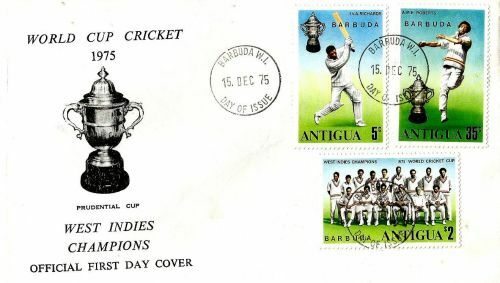 A set of three stamps was issued by Antigua on 15 December 1975 to commemorate West Indies winning the World Cup. The five cents stamp features I.V.A (Vivian) Richards, 35 cents stamp features Sir Andy Roberts and two East Caribbean dollar stamp features the victorious West Indies team. Antigua issued a limited number of Special Covers (200 Covers) to mark this occasion. 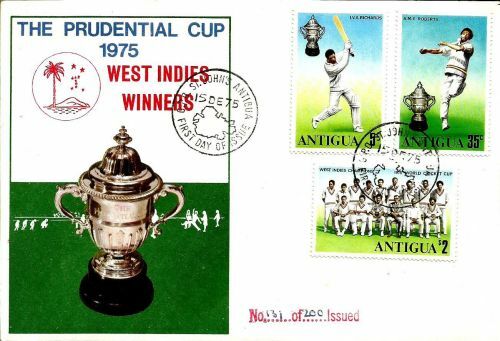 The Cover features the Prudential Cup and the caption 'West Indies Winners'. A unique set of three stamps was issued by Barbuda on 15 December 1975. They were issued to commemorate West Indies winning the World Cup. The cover features the Prudential Cup and the caption West Indies Champions.